It has been quite some time since I have used these words or phrases regarding friendship. In fact, I have rarely in my life had just one intense friend. As a happily married woman, I derive immense satisfaction from my husband and my children—so much so that it takes me by surprise when I have unintentionally let someone down who had expectations of me that I was unaware existed. I thought today I would address the topic of friendship from a few perspectives and perhaps it will help other women out there, especially those who live with titles such as “pastor’s wife,” “director,” and more (insert title or position here). I love no-pressure friends. These are women in my life with whom I can sit and not even say a single word, yet feel completely comfortable. These friendships did not arrive there without a shared journey that built trust and acceptance. But wow! When trust and acceptance abound, there is no pressure to try to earn or prove anything. With the intensity of ministry and schedule, I love this. I need this. I am refreshed by this. These are friends who buoy atop the ebb and flow of common interests. There are times when we are closer than others, but we are not threatened in the somewhat “off season waveforms.” Common interests provide a fantastic way to connect and then reconnect! In my life those areas are discovered within the categories of music, school, business, hobbies, and ministry. This is two-fold, and the Lord has hard-pressed me on this one over the past year, so I am going to linger here for a minute. Sometimes active ministry pursuits will bring friends together for seasons. Serving alongside each other provides the opportunity to grow deep roots. We who serve together deepen our love and trust of one another as we see the good and the ugly in ourselves and each other during our seasons of serving. Friending a person who needs to be served and loved is more effective than I ever realized. Something struck me hard a few months ago when sitting in our cafe listening to a woman who frequents Cre8Home for counsel and tangible assistance: I was ENJOYING our conversations. I was seeing her as a friend and NOT as a “person I was ministering to.” I was immediately struck with an image in my brain of picking up my phone to snap a selfie with her (no top teeth necessary) in order to let the world know that this woman — this not-altogether, broken woman — is not someone that I “minister to”… she is MY FRIEND! Can you imagine if everyone serving in ministry lived in such a way? And meant it? I believe with all of my heart that THAT is what God intends. Oh, that I would live in such a selfless way. We are to go out and produce fruit in our relationships by loving one another. I had a very special joy during these past weeks, getting to spend time with a friend I have much history with—our roots go deep. We are not clingy or jealous when others are in and out of each of our lives. There is no competition or territorial stronghold over our friendship. We simply know that we are there for each other, even in the absence of personal connection, and we love it when we are given the gift of time together. We don’t use words like BFF or Besties. We are just Shannon and Ami, and we love to support each other in living this life. She has other close friends, as do I. Our children hadn’t seen each other in two years as well, and we were able to surprise them all with a brief dinner in Ohio as the Scotts and I met up with Mike and the kids while heading home to our different states from Camp KidJam in Indiana. I was taken aback as I watched our kids connect as if no time at all had gone by. In fact, there was not enough time to venture to a local park or find something entertaining to do. We literally ate our lunch and then continued to talk a while longer in the parking lot alongside a busy road beneath the summer sun. The kids had nowhere to play, but they found a small patch of grass on the back side of the lot. We watched as Sadie and Ali picked flowers from asphalt and played imagined games, threading flowers in their hair, and creating fun with broken concrete. Giving life in dry seasons. Finding beauty in cracked spaces. Seeing continued growth in hard times. Knowing that roots are deep beneath the surface, even when you can’t see the blooms yet. Growing where you don’t necessarily choose to go. Providing selfless beauty for the sake of another. Making the very most of every opportunity and moment, even the hard ones. Finding contentment in being exactly who God has created while celebrating others. received from me in that 24-hour time period. Friendship roots are deepening within my family every day, and I pray for such deep-seated roots that when we arrive in tomorrow’s tomorrows, my kids will still want to water with conversations a beauty that will bloom into our cherished memories. I hope for my husband that we will continue to talk endlessly and effortlessly when we are old and gray. So right now, we plant. We water. We deepen the roots. There is not supposed to be a hierarchical tier in ministry. I don’t ever intend to see you in a tiered manner. We are just simply, friends. If Christ Himself would lead with friendship, then so must we. We are not stacking our relationships; we are circling around each other with support and care. As we love and lead one another in such a way, we have the opportunity to love and lead men, women, and children within our daily circles into a renewed awakening that God is Love and His Love is Real. He is Who He says He is, evidenced in our friendships, in order that we all might find His Life blooming unexpectedly in broken concrete spaces. I hope that the answer is clear: I want the person I am with to matter most. My hope is to cultivate and nurture friendships in such a way that my children will learn to cultivate in like manner, treating the person(s) they are with and each present moment with the most significance. There is of course a balancing act within this landscape. But please know that when we are together, I am in that moment and that moment matters. I have watched Mike do this so well. We know that Jesus modeled this perfectly well. I know that I will improve in such friendship-gardening finesse. With flowers and asphalt, beauty springs up in selfless, unexpected places. 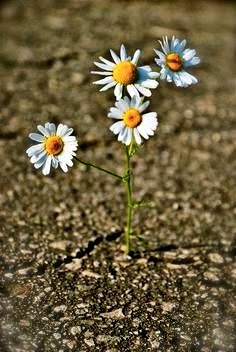 The flowers are taking root beneath the asphalt, not to be noticed. Yet to those walking along the road, the rise of the fragrance and colors stand out more brightly there than in any botanically adorned courtyard. So let’s serve and grow in every present moment and space, and see what blooms. FLOWERS AND ASPHALT. YES. Love you so much and LOVE our friendship. Would give anything for more and more often, but also am reminded that on this earth, we are always longing for more… because we know that one day, everything will be perfectly right. Thank you for being a forever and ever friend and for your ear, your wisdom and our belly laughs as we tried desperately to get Brandy to guess "Black Widow." Love you much and am looking forward to October AND our eventual trip to Cre8Home. I love you!